Before you do anything, figure out what you want to do and how much money you have to work with. If your budget is small, think locally–places you can drive to or are accessible via public transportation (here's a guide to making the most of your city). If you are looking to utilize flying or want to go international, your budget will need to be larger. Understand what you want to do and what is realistic! There are so many apps and websites to help you set a budget. If you use Mint, you can add a “goal” to save for a trip or vacation. Another way to start saving is to use your bank to open an additional savings account and set an automatic deposit (every week or every month, for example) for money to be transferred. This is an easy way to see how much you have available for your trip in a tangible way and can also help you to stay within your travel budget when the time comes to spend. If you plan most of your expenses out in detail beforehand, you can keep many of your costs as "fixed" and then determine a "flexible spend" budget for the trip. This can help keep your spending in control with less of a guessing game in terms of what you have available to spend. Make sure to leave a little space for souvenirs and other fun things (and unexpected things) that may come up! This is the fun part! Determine the when, where, and who. When do you want to go and for how long, where will you go, and with whom will you go? Once you determine if you want to travel locally, domestically, or internationally, you need to plan out exactly where you want to visit. Is there somewhere you’ve always wanted to go or a place that’s been on your bucket list forever? Or maybe your hometown is really cool and you want to plan a touristy staycation. Wherever you end up, surround yourself with the people you love and exciting activities that will help make the trip memorable, fun, and affordable. Again, there are tons of sites and apps to help figure out your plans. With Airbnb, you can search for homes and apartments to rent as well as experiences to do in the area. One way to save money is to consider renting a shared apartment or a single room in an Airbnb instead of renting the entire place. Also, the more people you travel with the more you can split costs. Home Away is another great site for searching for homes and apartments for rent and allows you to search based on price limits. If you’re going abroad, consider staying in a hostel for a part of your stay, where you share rooms at a very cheap rate. Another option is to stay somewhere outside the main area you want to visit since city centers can be more expensive. Look into public transportation options to see if it’s easy and feasible to access the places you want to visit. One of the biggest expenses (besides finding a place to stay) can be food. It’s really easy to eat out for every meal and end up with a huge bill that exceeds your budget. One way to save money while traveling is to utilize a kitchen if you can find an Airbnb or hotel that has such amenities. Try making it a goal to eat in for one meal a day, whether it’s a simple egg and toast breakfast, a grocery store picnic for lunch, or a quick stir-fry for dinner. Dinners can be one of the biggest culprits of spending money while traveling; try making lunch your main meal of the day so that you can save some money and eat a smaller dinner. Many restaurants, especially in big cities, offer lunch specials where you can still get all the same food at a reduced cost. Or if you’re traveling with friends, order small shared plates that you can all split to sample a few different local specialties. In terms of planning excursions, do plenty of research on what to do, when to do it, and determine if you will need to book ahead of time. Tripadvisor is a great resource for suggestions on what to do, eat, and see wherever you are going, but there are also tons of blogs and travel guides online for helping you plan your activities. For local and domestic trips, Groupon has tons of options for activities and excursions. There are fewer Groupons available for international travel, but it’s definitely worth a quick search. Airbnb also has a great “experience” section where you can browse for local activities with guides wherever you’re traveling. 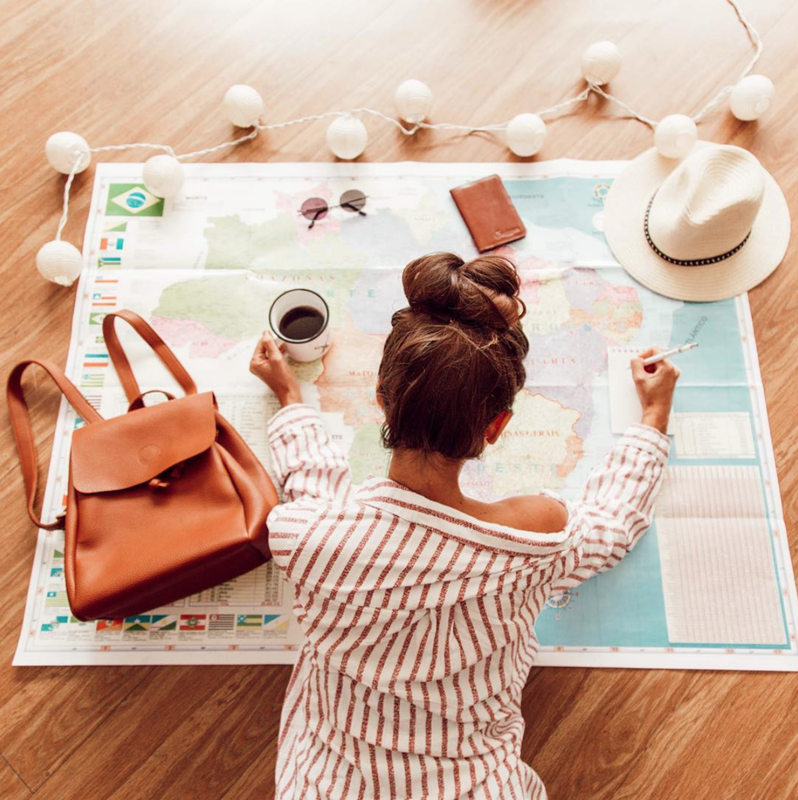 Try mapping out an itinerary with a list of activities and places that are free of charge, as well as noting down where you might have to spend some money if there’s something in particular you want to see or do. You can also utilize social media when it comes to making your plans. Try a quick search on Instagram for the place you’re visiting, and you’re bound to come across bloggers and local Insta-famous people who have already weeded through the coolest and best places to check out. Use their research for your own benefit! If you’ll be traveling with a group of people, make sure to keep track of expenses somehow. Start a spreadsheet with columns for what the purchase was, the cost, and who paid. At the end of the trip, tally it all up to see who owes whom what. Or, use an app like Splitwise, which allows you to create a group where individuals can input what they bought and for how much, and the app will automatically calculate the total costs owed. Once you’ve set a realistic budget, a place to go, and plans of what to do, you’re ready to go! So whether you’re planning an overnight down the shore with friends, or a week-long vacation to Europe, find excitement in the process of planning and know that you are capable of making this happen! So tell me, what places are on your bucket list? Share with me in the comments!